Fat, these days, is a bad word. But we can't survive without fats, and more particularly, without fatty acids. Fatty acids are small molecules composed of a long string of carbon and hydrogen atoms, with an acidic group at one end. They are used for two essential things in your body. First, they are used to build the lipids that make up all of the membranes around and inside your cells. Second, fatty acids are a concentrated source of energy, so they are often connected to glycerol to form fats, which is a compact way to store energy until it is needed. But as we all know, if we eat too much, this extra fat can build up! We get most of our fatty acids from our diet, but our cells also make enzymes that can construct most of our fatty acids, if needed. The construction of fatty acids is a stepwise process, adding carbon atoms two at a time to the growing chain. It takes four separate chemical reactions at each step, first adding the carbon atoms and then reducing them to the proper hydrocarbon form. It also takes several additional enzymes to start the process, and a few more to clip off the finished fatty acid at the end. Remarkably, in our cells all of these complicated tasks are performed by one long protein chain. It folds into a bunch of connected domains that each do different steps in the reaction. You can see a low resolution structure of our complicated fatty acid synthase in the PDB file 2cf2 . 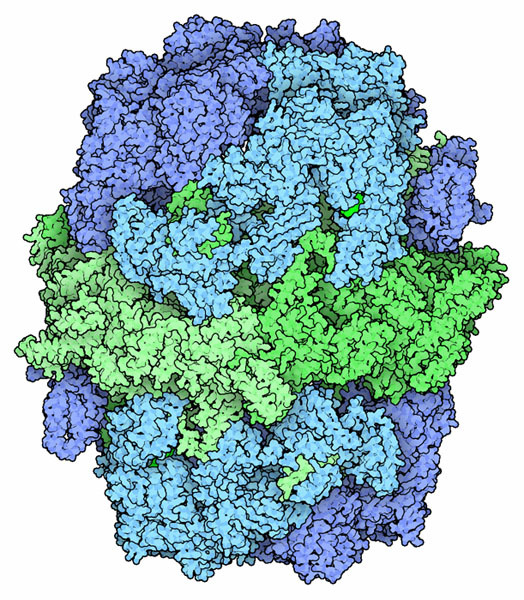 The one shown here is from a fungus, from PDB entries 2uvb and 2uvc , which combines all of these functions in two chains. The entire complex has 12 chains total, six alpha chains the middle (in green here) and three beta chains at each end (in blue). All the action happens inside this big hollow ball. Inside, the growing fatty acid is attached to a flexible tether and it flips from site to site inside the enzyme as more and more carbon atoms are added. Four bacterial enzymes involved in fatty acid synthesis, and acyl carrier protein (center). Plants and bacteria, on the other hand, build their fatty acids using a bunch of separate enzymes. Four enzymes from bacteria are shown here, from PDB entries 1kas , 1i01 , 1u1z , and 1dfg . Together, they add two carbons to the growing chain and then reduce them to the proper state. The small protein in the middle, called acyl carrier protein (PDB entry 2fae ), acts as a shuttle that carries the fatty acid chain from enzyme to enzyme as the changes are made. You might wonder which approach is better: a bunch of separate enzymes or a big complex like the one on the previous page. Our fatty acid machine is highly efficient. Since everything happens in one big protein chain, the growing fatty acid can be shuttled very efficiently from site to site. The disadvantage, however, is that our multienzyme machine is hardwired to produce mainly one fatty acid: palmitic acid. In bacteria and plants, other enzymes can be added to the collection to produce a whole variety of different fatty acids, although a bit less efficiently. You can see the growing fatty acid chain in several structures of acyl carrier protein, the protein in bacteria and plants that carries the fatty acid from enzyme to enzyme. Acyl carrier protein has a special cofactor attached to a serine amino acid, called phosphopantetheine (colored with traditional atomic colors at the top). It is long and flexible and allows the fatty acid to snake its way into the enzyme active sites. 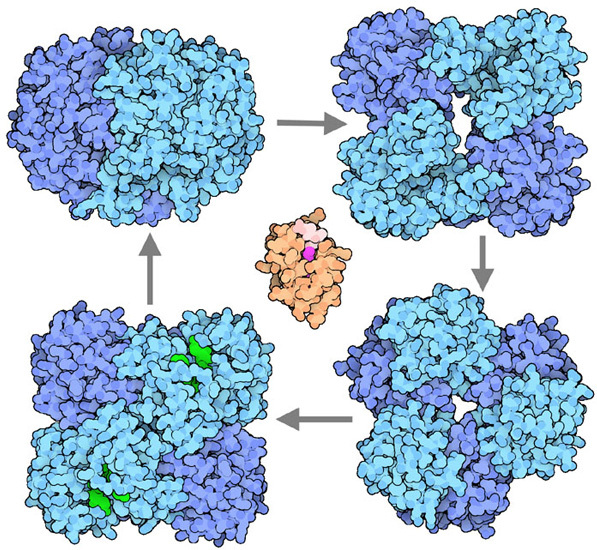 When it is not attached to an enzyme, the carbon chain (colored magenta here) is sheltered inside a deep groove in the acyl carrier protein (the protein chain is colored tan here). 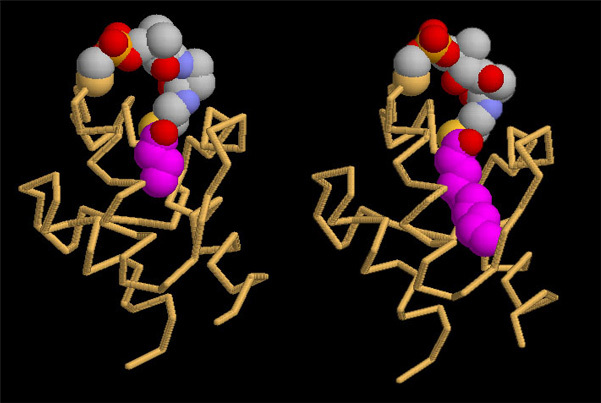 Two structures are shown here: one with four carbon atoms added to the growing chain (on the left from PDB entry 1l0i ), and one with ten carbon atoms (on the right from PDB entry 2fae ). You can also find structures with other lengths in the PDB, as well as acyl carrier proteins with no fatty acids attached. These illustrations were created with RasMol. You can create similar illustrations by clicking on the accession codes here and picking one of the options for 3D viewing. S. Smith (1994) The animal fatty acid synthase: one gene, one polypeptide, seven enzymes. FASEB Journal 8, 1248-1259. S. W. White, J. Zheng, Y. M. Zhang and C. O. Rock (2005) The structural biology of type II fatty acid biosynthesis. Annual Review of Biochemistry 74, 791-831.